The Leister Minifloor unit is an exciting development from Leister, with Swiss engineering, it is a reliable, compact, efficient, affordable new addition to our welding range, and ultimately provides a faster way to weld.. It was designed for professional use, by LEISTER the true welding experts. Simply connect a Leister manual weld gun to the drive unit.....and go.......in "auto mode" !! This unique new drive unit converts a standard weld gun, such as the Leister Triac S, ST and BT models into an automatic welder. 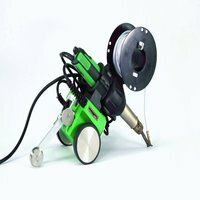 The “Quick-Lock” fastening mechanism allows the weld gun to be connected to the drive unit and ready for action in just seconds! The automated process of welding means the installer is working faster and with more precision, with welding speeds of approximately 2 metres per minute, roughly twice as fast as conventional welding with standard guns. Say goodbye to manual welding, this automatic welding unit makes your weld quick, simple and precise, saving you time and money. The Minifloor unit is light and easy to transport, as it weighs just over 5kg, - perfect for small/medium sized contract jobs. Running parallel to a wall, close edge welding is possible, in addition to the unit being suitable for most limited spaces. The Leister Minifloor unit provides ultimate flexibility. If you attach an older model welding gun to the unit, e.g. the Triac S, a rubber connector bracket is required to ensure a correct fit (which is available as a spare item, code 225-880-010).